Some students excel at learning while others lag behind in the overall process. What makes one student more successful than another has always been an interesting topic for educators. A study by Kiss, et. al. (2014) delves into higher academic achievement and its association with intelligence (IQ), emotional intelligence (EQ), and personality preferences of students. Understanding what types of students are most likely to be successful helps in college selection and advanced placement. Intelligence can be something difficult to define as it takes into consideration a broad range of skills that impacts a person’s ability to navigate their environment. It can be seen as, “a very general mental capability that, among other things, involves the ability to reason, plan, solve problems, think abstractly, comprehend complex ideas, learn quickly and learn from experience” (Gottfredson, 1997, p. 13). Those who are intelligent question their environment and try and understand the world around them. As intelligence rises, the higher the ability to solve complex problems becomes apparent. Intelligent thinkers excel quickly in learning and seem to grasp concepts faster than others. Emotional intelligence is also something that can be difficult to comprehend. It can be defined as “a type of social intelligence that involves the ability to monitor one’s own and others’ emotions, to discriminate among them, and to use this information to guide one’s thinking and actions” (Mayer & Salovey, 1993, p. 433). It is a process of awareness of internal and external states of feeling. Emotionally intelligent people are not unemotional but are aware of the ranges of their emotions and can monitor them. They may also be more in-tune with the emotional nature of those around them. They can pick up on the cues, behaviors, facial expressions, and logic of language to assess how others are currently feeling. The student’s personality type is the way in which the student views the world. It is the style of understanding they are most natural and comfortable with. Tests such as the Myers–Briggs Type Indicator measures introversion-extraversion, sensing-intuition, thinking-feeling, and judging-perceiving planes of personality. Different personality characteristics determine how we understand the world and come to conclusions about it. The study found that lower IQ hindered academic performance while education could not indicate individual cognitive differences at higher levels of intelligence. Lower EQ hindered performance while higher EQ improved performance. Success was also associated with introversion-extraversion, thinking-feeling and judging-perceiving. Educational attainment certainly has many other compound factors such as access, cost, and social support that help students be successful but IQ, EQ, and personality influence the success of those that attend higher education institutions. It should not be forgotten that formal education does preference particular styles of learning and those that fit within that style are more likely to be successful than those who do not fit within institutionalized education curriculum. Gottfredson, L.S. (1997) „Mainstream Science on Intelligence: An Editorial with 52 Signatories, History, and Bibliography,” Intelligence, vol. 24(1), p. 13-23. Kiss, M., et. al. (2014). 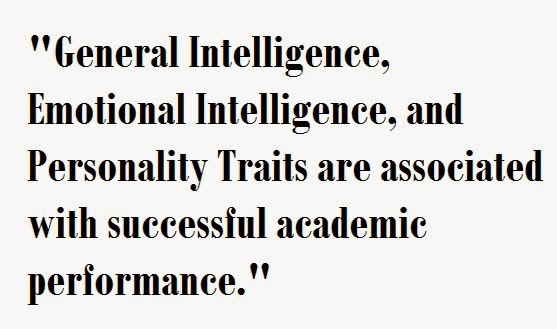 The relationship between intelligence, emotional intelligence, personality styles and academic success. Business Education & Accreditation, 6 (2). Mayer, J.D. and P. Salovey (1993) “The Intelligence of Emotional Intelligence,” Intelligence, vol. 17(4), p. 432-442.